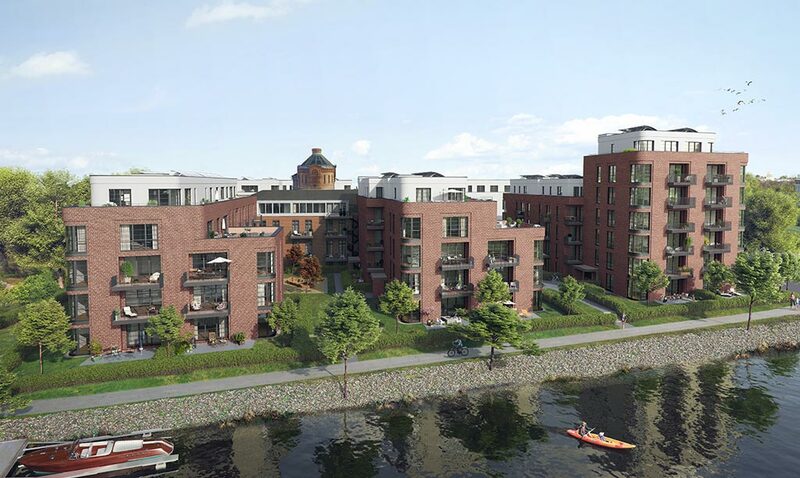 The project “StadtLandFluss” (CityCountryRiver) combines the best of three worlds: the CITY – a place full of diversity, culture and economic dynamism – the COUNTRYSIDE in the form of a natural, green environment, and the RIVER for boating or paddling. 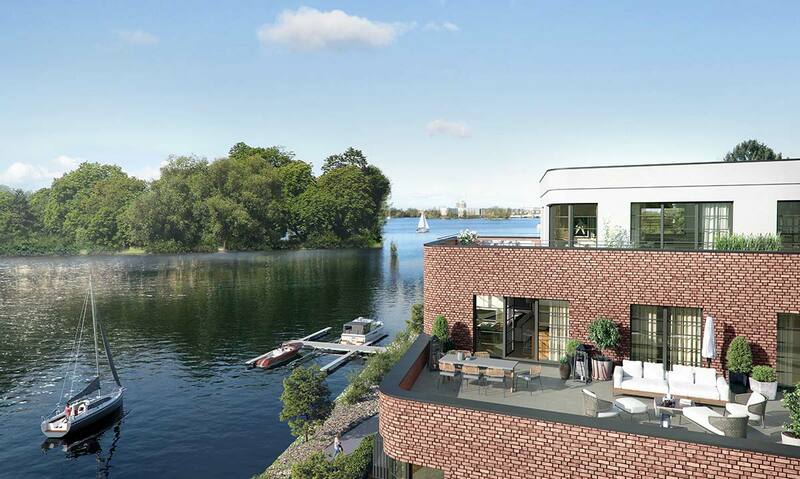 Approximately 195 freehold apartments are planned in Kleine Eiswerderstrasse, directly on the Havel riverfront. The almost 11,500 m² plot stands out not only due to its unparalleled waterfront location, but also thanks to a historic industrial ensemble from the imperial era. A listed building of the royal powder factory is to be fully and carefully refurbished and transformed into spectacular lofts. The challenge when building on a landmarked site is to preserve the old charm and create new value. The buildings should not only complement each other perfectly, they should also be set in scene. The old facades often speak for themselves: The impressive tower and the powder factory will be lovingly restored and their interiors will be upgraded according to modern standards. The plan is to surround the refurbished factory building with five new buildings. A residential mix is envisaged that will satisfy the future residents’ desire for open space, individuality and high quality of life. Be it families, couples or singles – the various requirements are interpreted with great sensitivity and implemented in modern living environments. 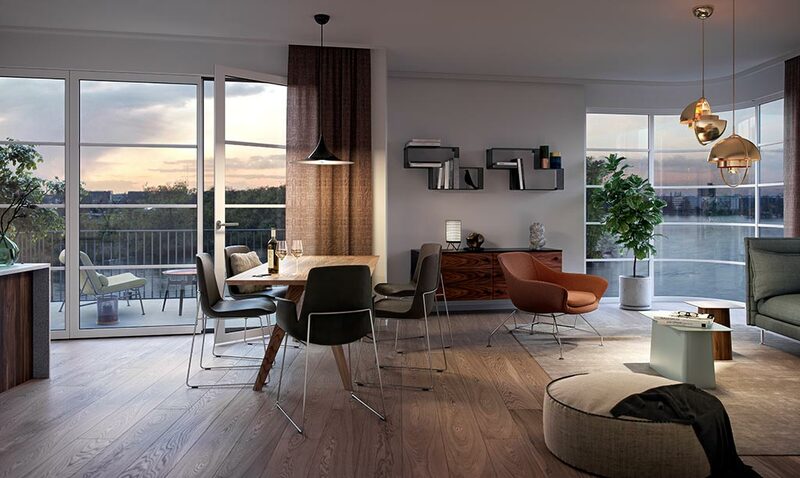 2 to 5 bedroom apartments are planned, as well as townhouses with private garden, lofts and penthouses sized between 58 m² and 259 m². 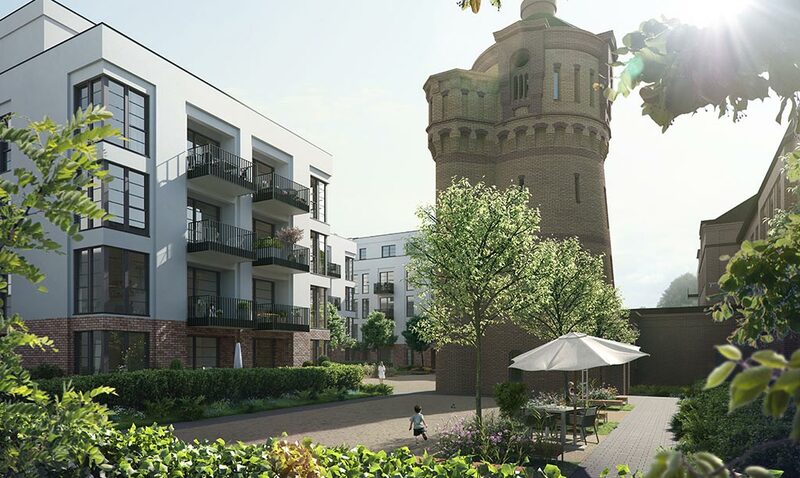 Those who enjoy calmer activities can catch up with friends and neighbours in the neighbourhood square at the water tower – where they can indulge in French lifestyle and play a round of boules. The developer, 6B47 Germany GmbH, is an established project developer that operates Germany-wide. The focus is on high-quality residential, hotel and commercial real estate in the top 7 cities as well as on good inner-city locations of B-cities. 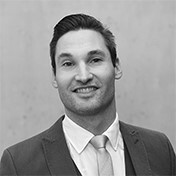 INVENTIO is serving as a competent sales partner to 6B47 in this extraordinary project, providing profound market expertise and drawing on its extensive experience and passion for prime real estate. In all probability, sales will commence after the end of 2018. 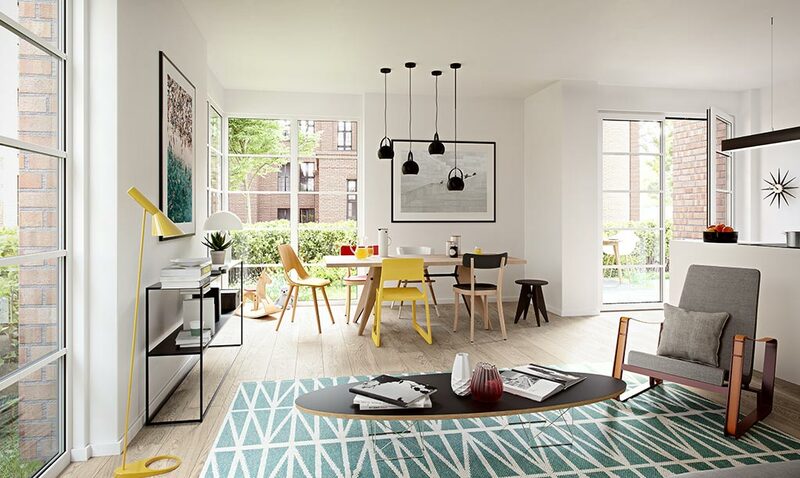 Register here to reserve a unit so that we can contact you before the official sales launch. 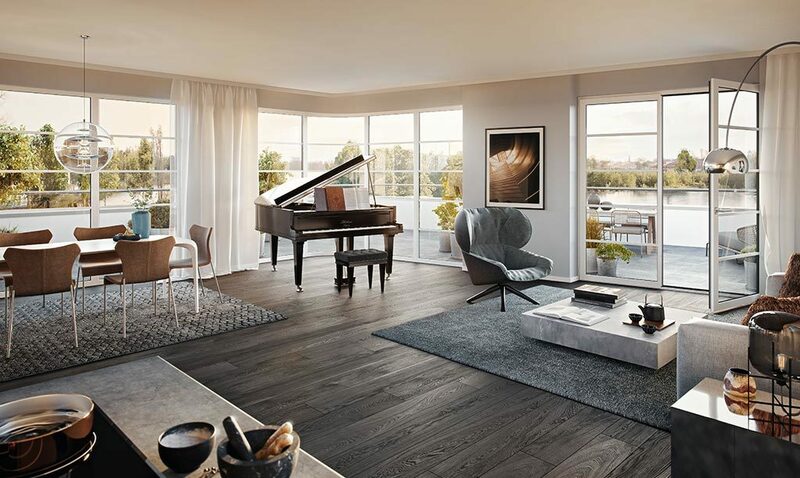 The “StadtLandFluss” residential ensemble uses proven simplicity and naturalness in the interior design of its apartments, townhouses and penthouses. It is the quality of the materials and the touch and feel of its surfaces that engenders its enormous appeal. The design language of the architecture is complemented on the inside, where windows, floors and a sense of space combine to form a holistic living concept that has only one goal: well-being in its purest form. Convenient and technical details on the building facades and in common areas, such as brick facing, greened roofs or sun protection, harmonise well with the stylish overall appearance of the ensemble. Chargers for electric cars commit to sustainable mobility. 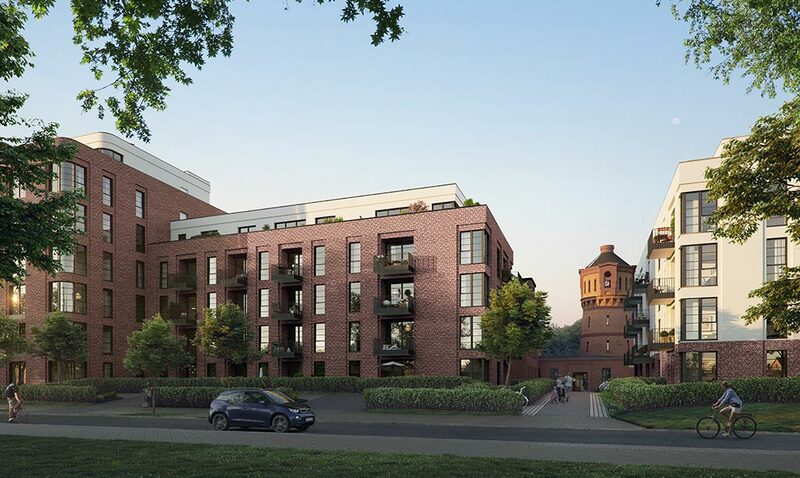 And in the apartments, video intercom systems, state-of-the-art heating systems as well as the curated living facilities leave nothing to be desired. Berlin’s City West is currently experiencing the dawn of a new era. The Kurfürstendamm is becoming increasingly stylish, the architecture is getting highly visible landmarks, and a new art and culture scene is evolving. The new zeitgeist is spreading out and taking over the long-established districts in the west, where new residential areas are growing in popularity. Spandau, for example, is not only situated close to the city, but also offers many natural advantages: proximity to the green surroundings, the banks of the Havel River and the vibrant old town with the largest pedestrian zone in the city. The establishment of the lakeside suburb along the Havel created a city within the city of Berlin that stretches along the upper reaches of the Havel River and the island of Eiswerder. The urban redevelopment here is ecologically-oriented. The transport links from Spandau, Haselhorst and Tegel provide good preconditions for a mobile life. The Berlin airports, the Zoologischer Garten train station and the main motorway connections are easy to reach by car or public transport. The closure of Tegel Airport and the upcoming developments on the airport site will have a positive impact on Spandau. The three underground stations in Spandau ensure a fast connection to the city west and centre. Water – as far as the eye can see. Here, along the Havel River, waterfront living goes hand-in-hand with the advantages of the nearby city. Another highlight are the boat jetties in the immediate vicinity. Both the city centre of Berlin and the surrounding region can be reached from here via waterways. In addition to nature and relaxation, there is also a good selection of cultural enjoyment: The citadel with the Julius Tower – Berlin’s oldest building – is not only an open-air museum, but also a popular pop and rock concert venue. In the nearby Havelwerke on the site of the former Prussian powder factory is an industrial park for collectors, craftsmen, artists and creative people of all kinds. An ideal location: The urbanity brings inspiration and the proximity to the water brings the idleness that feeds creativity. Numerous infrastructure facilities have been established in the context of the urban development, including day care centres, playgrounds, parks and sports grounds. Depending on the location, there is also a good selection of shops and supermarkets nearby. The bus stop “Kleine Eiswerderstrasse” (line 236) is in close walking distance. The underground station Haselhorst, which is three bus stations away, can also be reached on foot within 15 minutes.